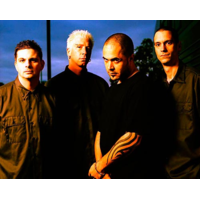 Staind (pronounced /ˈsteɪnd/, STAYND) is an American rock band from Springfield, Massachusetts, including lead singer/guitarist Aaron Lewis, lead guitarist Mike Mushok, bassist Johnny April and drummer Jon Wysocki. Over the past 15 years the band has recorded six studio albums, had multiple chart topping singles, and sold over 15 million records worldwide. Staind is well known for using baritone guitars and over 20 guitar tunings, which helps give the band its distinctive sound.